station Sunday morning for its next destination on its journey to cover more than 4,000 kilometres. Pakistan Railways senior officils and the general public saw off the special train. Its next stop is Sahiwal railway station, where it would stay for one night. Attock, Rawalpindi, Jhelum, Malakwal, Sargodha, Faisalabad, Hafizabad, Gujrat and Gujranwala railway stations. 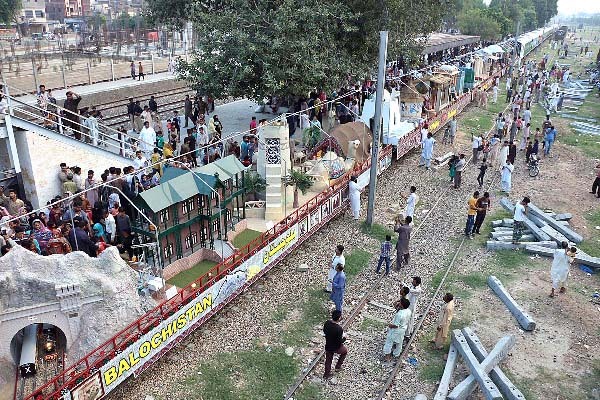 A large number of people visited the train during its stay here and appreciated the art-work, floats and cultural colours of different parts of the country. A musical program and puppet show was also arranged which was highly liked by the visitors. The train has been beautified with national green and white colours and it is representing cultural and local traditions of all four provinces, Gilgit-Baltistan and Azad Jammu and Kashmir. A large number of people were taking interest in the train at all railway stations from where it was passing.